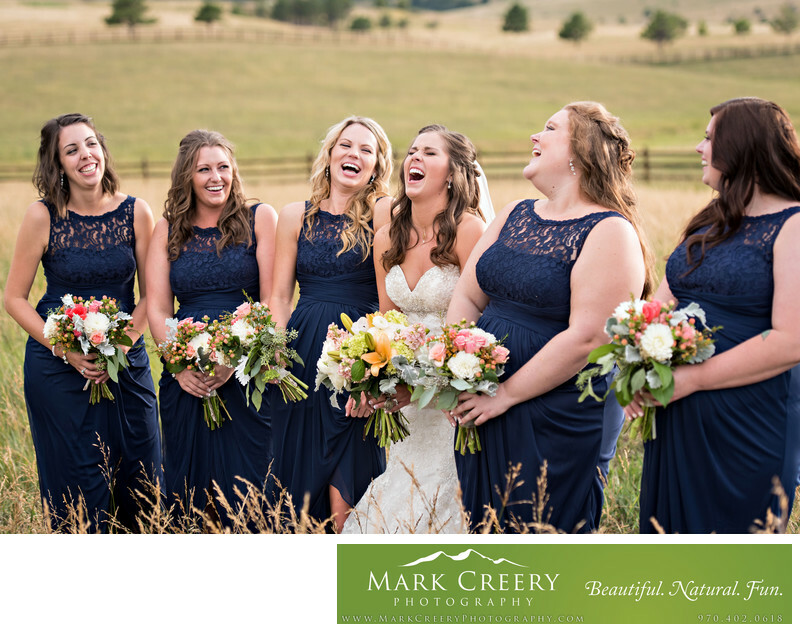 Capturing genuine laughter, like with this bridal party at Spruce Mountain Ranch, is the best part of wedding photography for me. It shows the obvious joy that people are feeling. Too often I see wedding photographs where the photographer is trying to force something artistic on the subjects, and in doing so takes away the emotion. The subjects become worried that they're not doing what they're asked of correctly. This gets them thinking too much and it shows in the final image. The photo might look gorgeous, but if it's without a real emotion the viewer can feel I think it's a wasted opportunity and doing the couple a disservice. To create this photo, I started off with the bridesmaids all together in a standard 'pose'. But then I just let them interact and see what they came up with. This photo actually started with one of the bridesmaids doing a completely fake laugh, which then caught on a quickly became real laughter. Mission accomplished! They all joined in and had a great time. Sometimes the end justifies the mean. I might also give an awkward direction just to get the bridal party in stitches. This venue has a perfect backdrop of rolling hills of long grass and fences. Spruce Mountain Ranch is located in Larkspur, Colorado. Contact: (719) 484-0800, info@sprucemountainweddings.com. Location: 14771 S Spruce Mountain Rd, Larkspur, CO 80118.